After an exciting Preliminary Stage, six returning challengers and three new challengers are moving on to the next phase. This weekend, watch as sixteen teams fight for Legend status and the chance to compete in the playoffs. 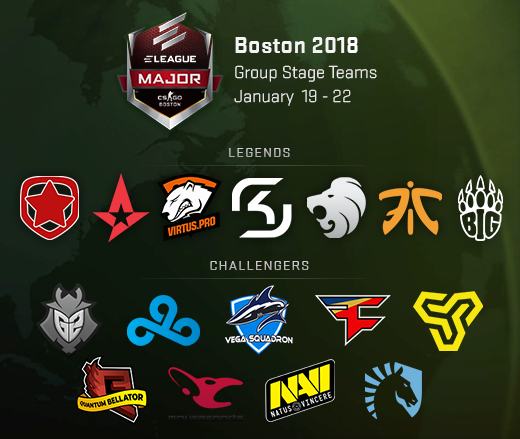 You have until the start of the first match on Friday to make your picks for the Group Stage of the Pick’Em Challenge. Not sure how to rank the remaining teams? Historically, successful teams prevail for multiple Majors in a row. For the last seven Majors, at least six Returning Legends successfully defended their Legend status. Will the trend continue? Will the Returning Legends maintain their momentum? At the Major, there are no guarantees. UGC League Announces Winter Season 2018!